With temperatures having been consistently over 90 degrees Fahrenheit (30 degrees Celsius) again this weekend and similar temperatures being forecasted for the whole upcoming week, I wonder if Southern California is hit by yet another heatwave or if this is the new normal. 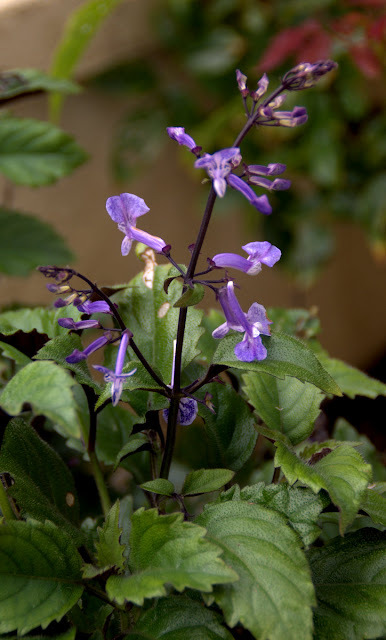 It almost doesn't matter if the first or the latter is true, gardeners are forced to look for more drought and heat tolerant plants whether they like it or not, in case they still want to have a garden in the future. 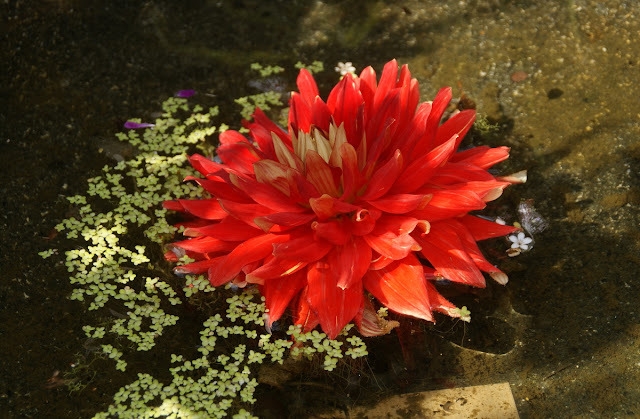 So I bow to nature and try to find new drought and heat tolerant plants for my garden that I can love. 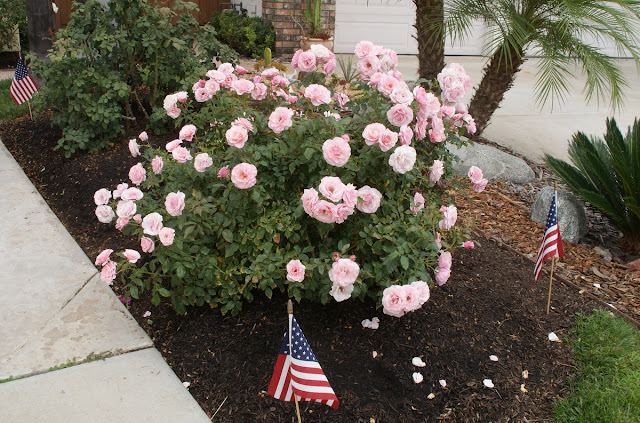 I have to admit there are many drought tolerant plants that I don't like. 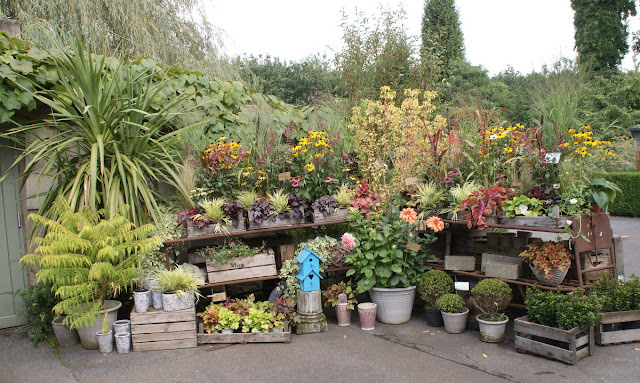 But in the last weeks I was making a serious attempt to find drought tolerant plants that still go well with my idea of a dream garden. And as always when you truly search, you are very likely to find something. I recorded another Periscope broadcast today where I show my new drought tolerant plant purchases. Are you curious what plants I got? 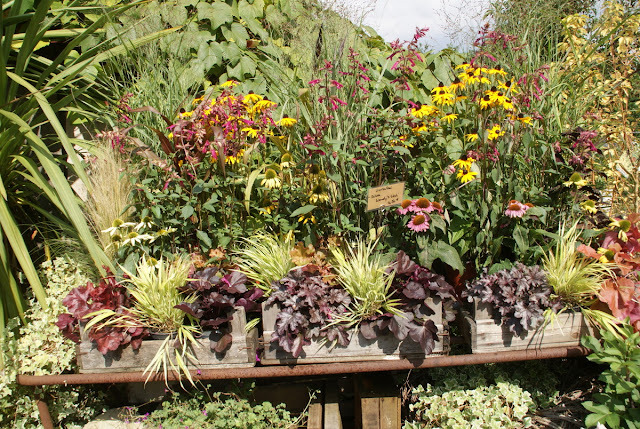 Here they are: Verbena bonariensis, Stachys monieri 'Hummelo', Liriope muscari 'Super Blue', Bearded Irises 'Best Bet', 'Rio Vista' and 'Clarance'. Please, take a look at the video to see them in person. Tomorrow it will be official: Summer is over and to be quiet honest with you, I am glad about it! This year summer was a torture for the garden with in general very high temperatures, a couple of heatwaves on top of that and the toughest water restrictions since I garden here in San Diego. Because of the heat I hardly did any gardening since the end of June, except the most necessary maintenance chores. And when I did try to plant something in the last two months, it is very likely that I have lost it again by now. Lesson learned: Avoid planting new plants in the heat of summer. I hope that temperatures slowly will come down from now on, even though in San Diego it is very likely that we will have some very hot, arid and windy days caused by Santa Ana Winds in September and/or October. 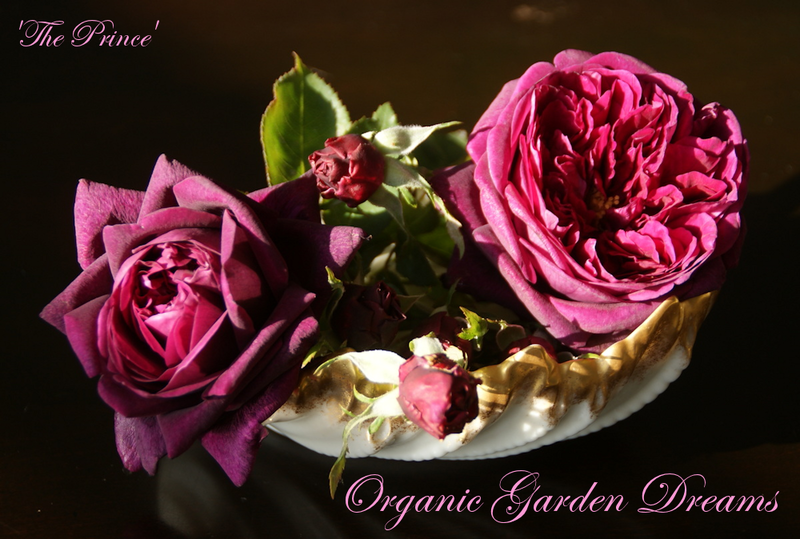 Besides my complains above there was of course a lot of beauty happening in the garden and I would like to share some photos with you that I have taken this summer. 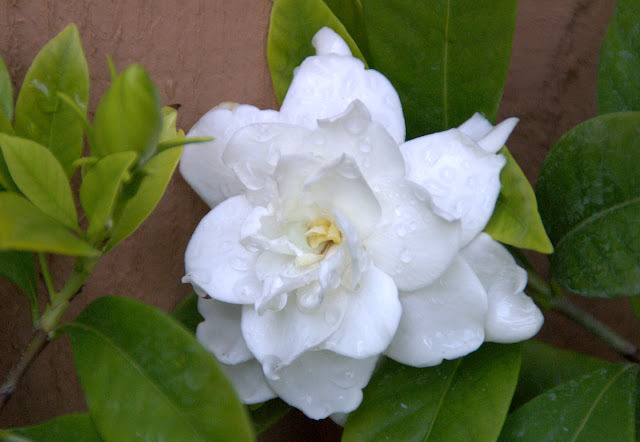 On the first glance you could think that this is a rose, but no, it is an exquisite gardenia 'Veitchii' bloom. 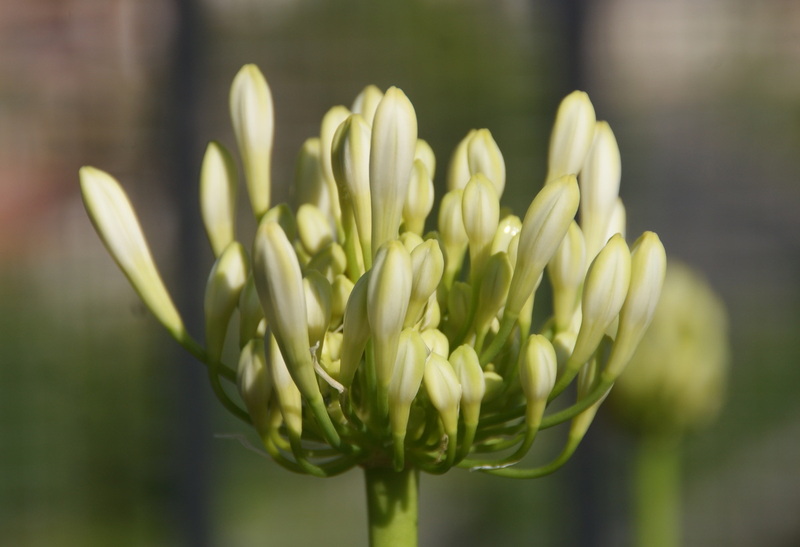 ...and was blooming as profusely as never before. 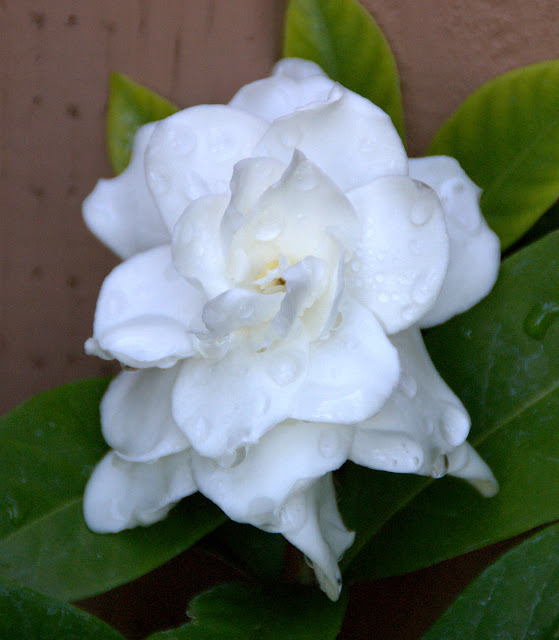 And the fragrance of a gardenia, what can I say, it is simply out of this world. 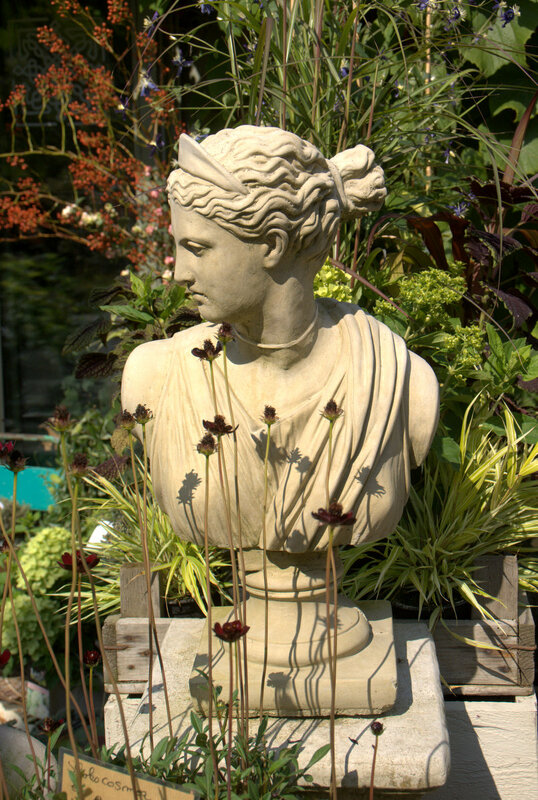 'Neptune' has been doing well since transplanted into a big terracotta container on the backyard terrace. The blooms of this rose have a beautiful lavender color and the fragrance is equally pleasant. 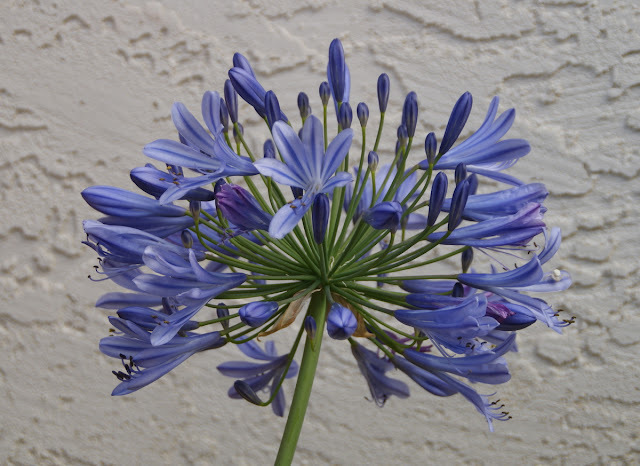 ...and some were blooming generously. 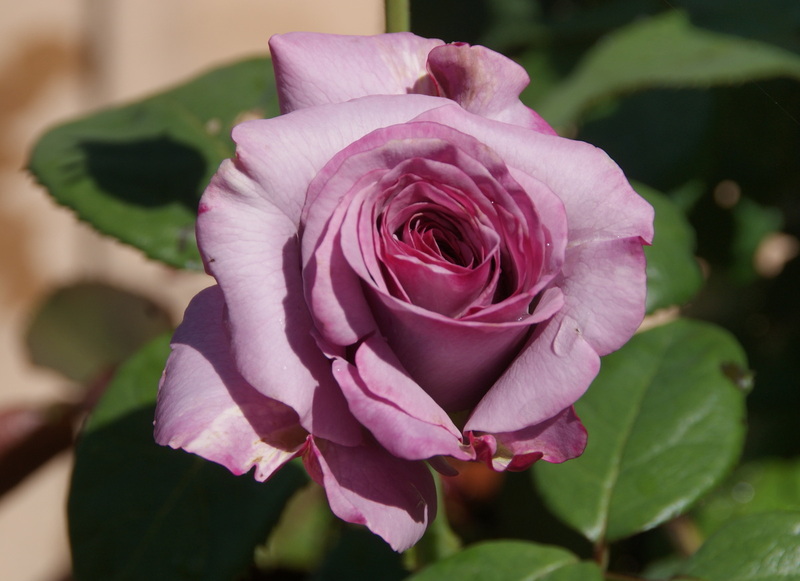 'Yolande d'Aragon' had a good second rebloom. I somehow like this shot quite a bit of the same rose. The beautiful blooms of 'Cymbaline', an older David Austin rose that you don't see too often, were another nice surprise to me this summer. 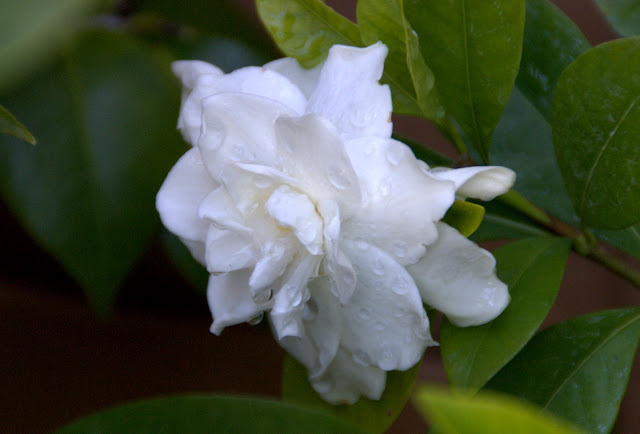 ...couldn't withstand the heat and sadly I pulled it out about a week ago, since I have come to the conclusion that it is unsuited for my climate. 'Chandos Beauty' is one of the few roses that really likes the heat. 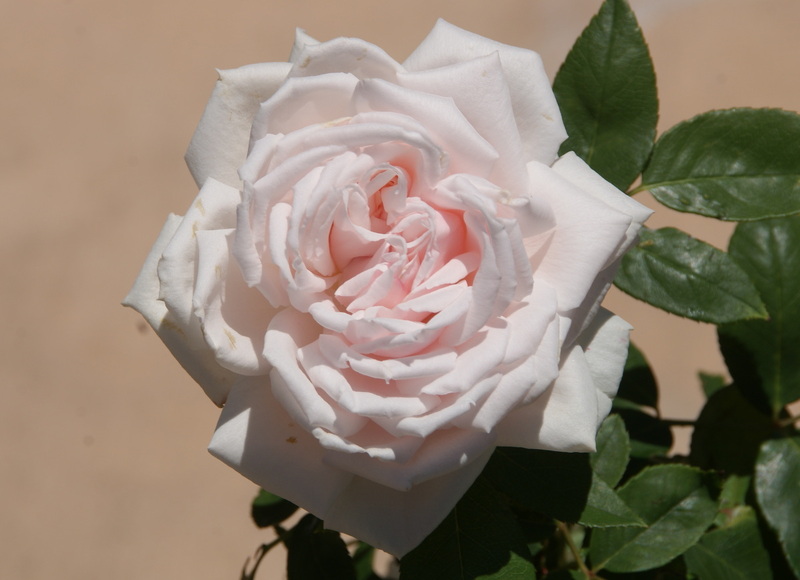 The blooms are always gorgeous and the rose bush itself is very healthy. ...but who can resist those flowers? 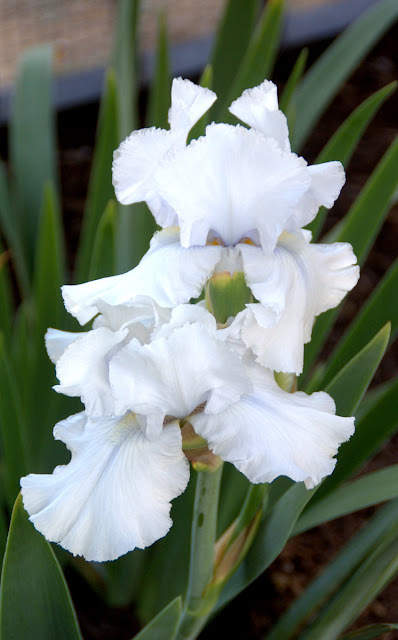 My bearded iris 'Platinum' also surprised me positively this summer and rebloomed not just once but twice for me. And I almost had thrown it away because it wasn't doing anything for quite a while. Now I am so glad that I didn't! 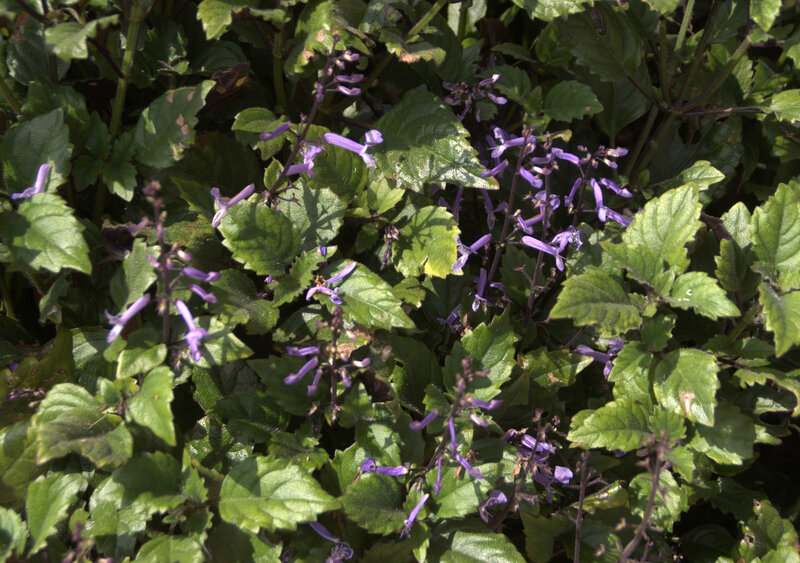 Hardy geranium 'Rozanne' is unfazed by the heat as long as it gets some supplemental water and is fertilized. 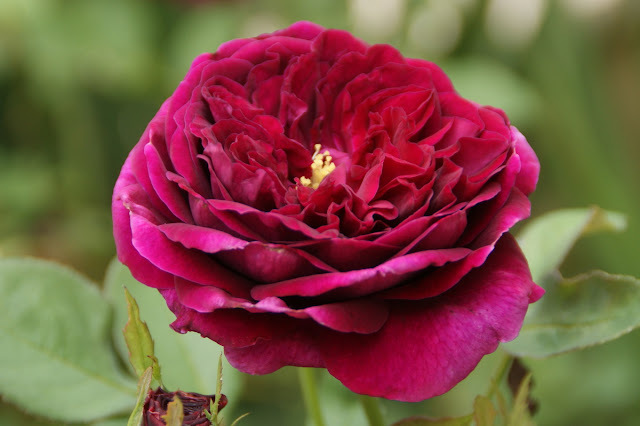 I am on the fence, if I should keep the Mini-Flora rose 'Moonlight Scentsation' or not. I love the off-white blooms with lavender or even brown undertones, but the rose mildews on a regular base, which really bothers me. 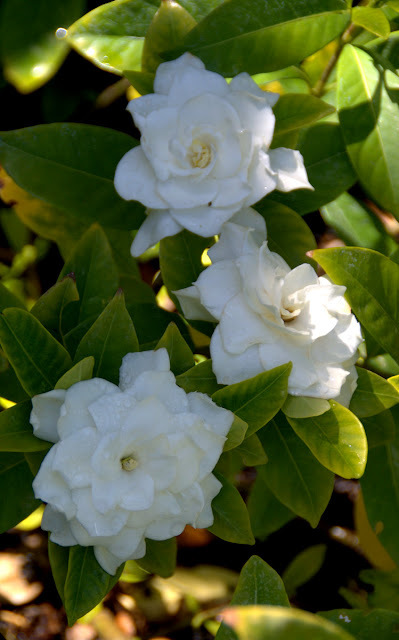 It is kind of the same situation with 'Captain Christy': Beautiful blooms, but ugly powdery mildew. 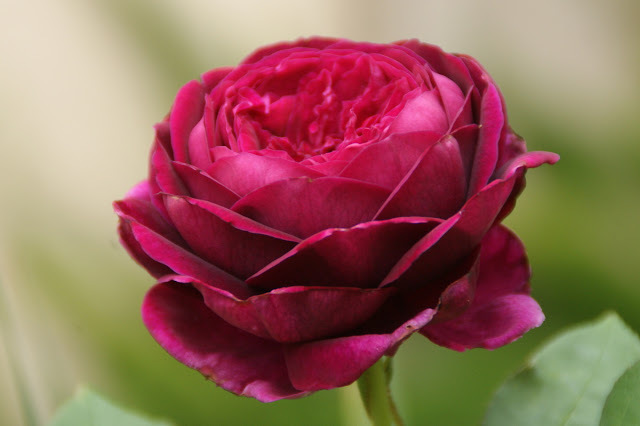 This rose is an heirloom rose that is hardly available in the nurseries anymore, so for that reason I might give it another year. Here is a shot of 'Our Lady of Guadalupe' taken around 4th of July. This rose amazes me regularly with her profuse flushes of blooms. How do you feel about the end of summer? What ever your feelings are, I am definitively wishing you a lovely autumn! Last Sunday I broadcasted another video on Periscope that I would like to share with you here as well. That day, when I taped the video, it was still boiling hot in San Diego, but Tuesday we finally got a good amount of rain and the temperatures came down a bit and instantly the whole atmosphere in the garden changed for a brief time and it felt really autumn-ish. But we are back to hot temperatures by now, again. In this video I am focusing again on plants that do well in my garden despite the heat, but also on plants that really failed in my climate. Your will see a few roses: 'Our Lady of Guadalupe', 'Lavender Crystal', 'White Meidiland', 'Neptune' and a few others varieties as well. 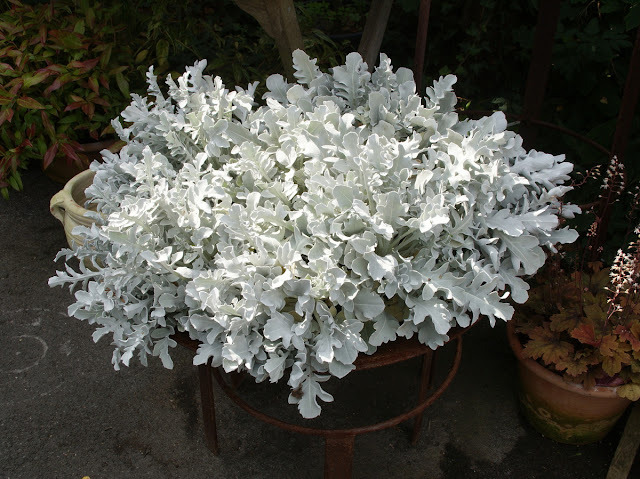 I also touch on some other plants like for example the white flowering dianthus 'Floral Lace White', the daylily 'Siloam Double Classic Pink', alstroemeria Princess Lilies 'Claire' and dichondra sericea 'Silver Ponyfoot', a favorite ground cover of mine, and some more. 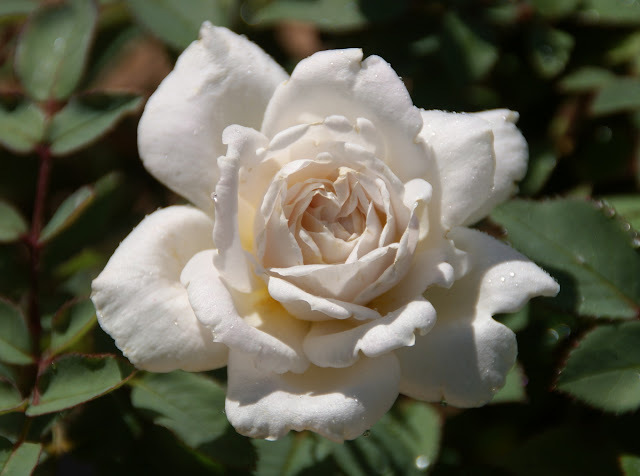 I am also talking about fertilizing roses with fish fertilizer and recommend a brand that works well for me in my garden. 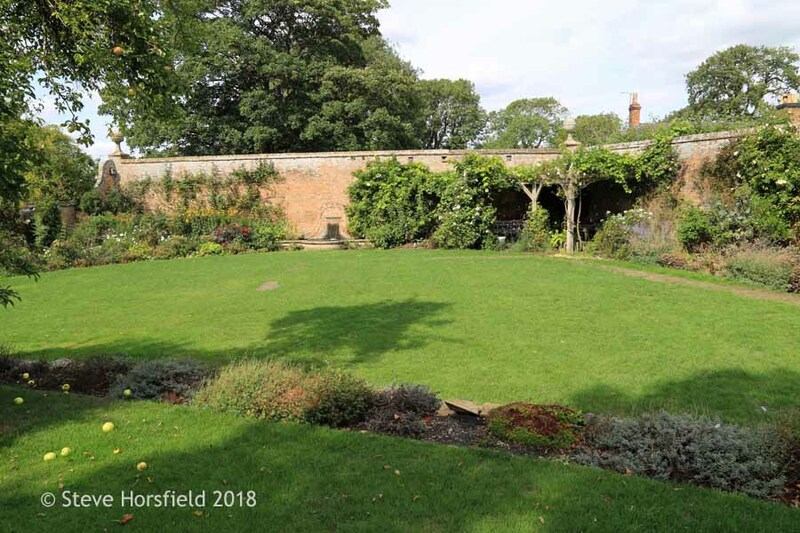 I hope you enjoyed the tour and, if you are gardening in a similar climate, got some tips with regards to which plants could do well for you in your own garden and which ones may not. Thanks for watching my video! This summer has been hot and partly surprisingly humid here in San Diego. A good reason to use our pool to cool down. Strangely my husband and I hardly hop in, but we thought maybe our beloved dog would like it, so we tried carefully to get him acquainted with the pool and slowly lure him in. But boy, were we wrong. Skylar was scared of the pool! So my husband thought we start with baby steps and bought Skylar a baby pool. If you click on the video below you can watch Skylar's first four trials to explore the water. I was surprised how quickly Skylar learned that there is no danger coming from stepping into the baby pool, but even up to today he isn't using it to cool himself down. He seems to be like my husband and I and simply isn't keen on pools. Well, he certainly fits into the family! 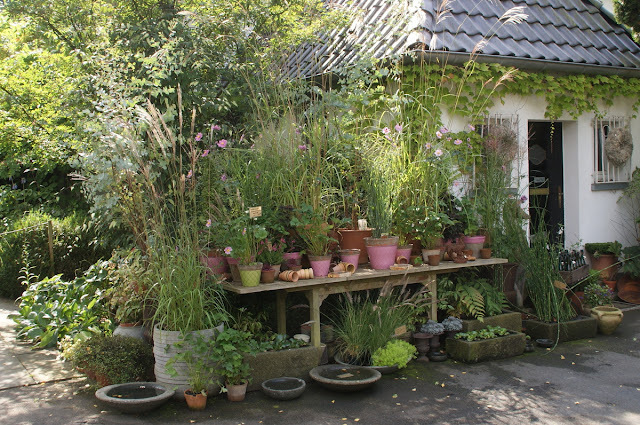 A few days ago I had the chance to visit the private garden of Peter Janke called HORTVS, located in Hilden, North Rhine-Westphalia, Germany. 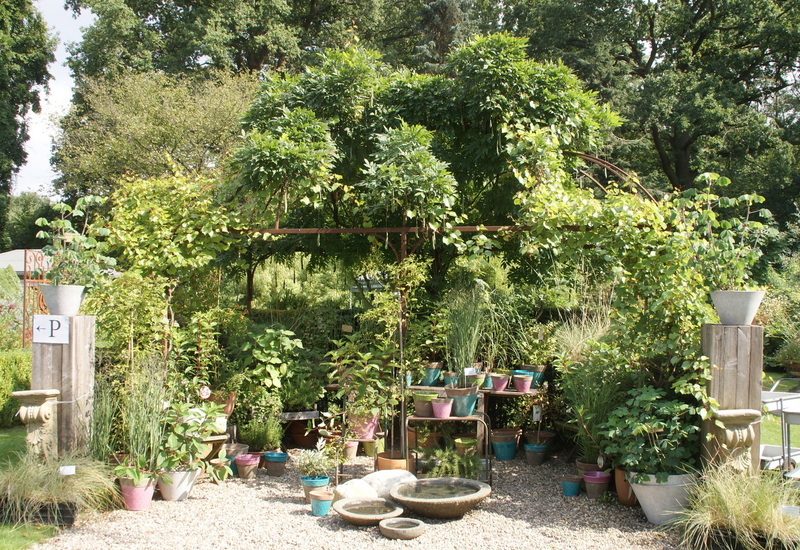 I have been wanting to see this garden for quite while now and I was very excited when the possibility opened up to me. 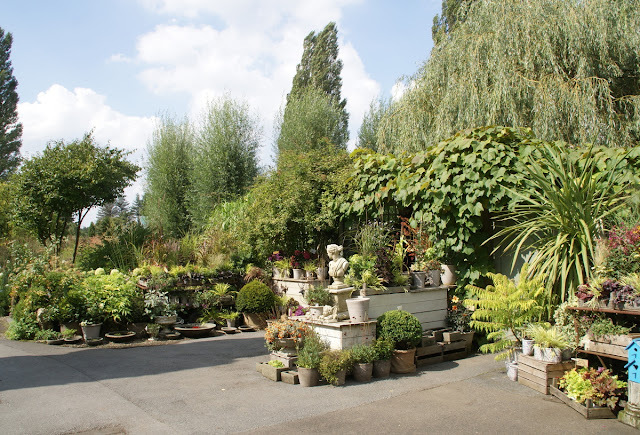 The property also contains a nursery and a garden and florist shop as well. 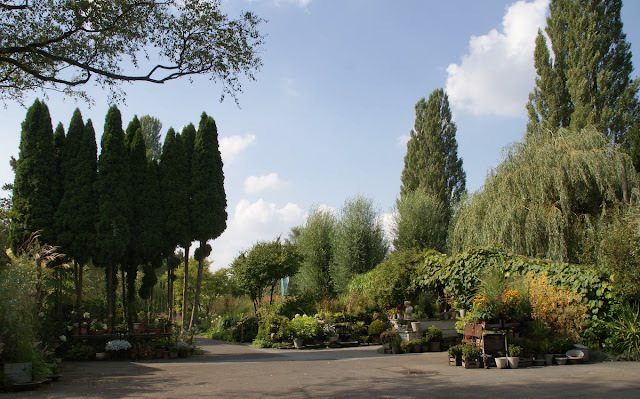 In this post about HORTVS I start with showing you the area close to the garden and florist shop where some plants for sale were arranged in a very nice display. You simply had to buy plants there, or at least I would have if I would still live in Germany and not just visiting, as they were shown to their best advantage and you instantly got great ideas which plants would combine well with each other. 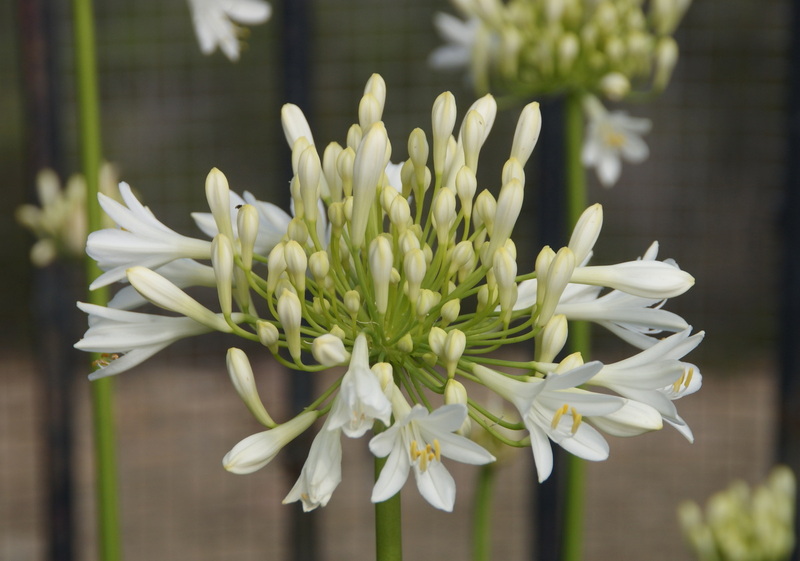 Since I love white gardens I was immediately drawn to this area containing white flowering and silver leaved plants. 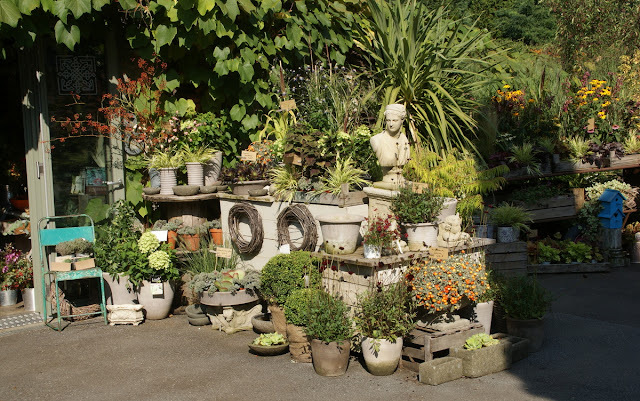 I was pleased to see that they made the effort to arrange the plants in beautiful, different and unusual mostly terracotta vessels. The one plant that I really wanted for my own garden is this gem, called Eis Flockenblume, Centaurea candidissima 'Silverado'. The leaves were so soft to the touch. I have to see if I can find it in California as well. 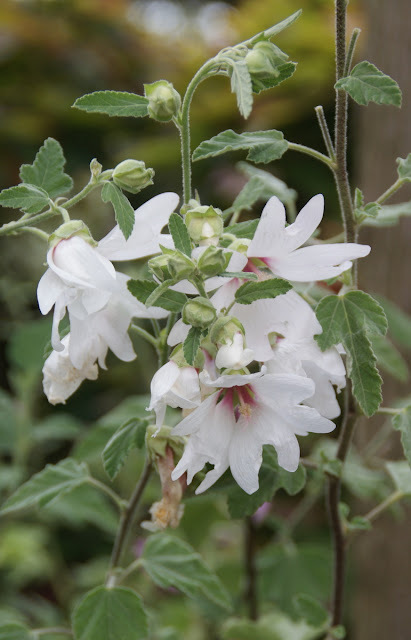 Another one that I was smitten with was the Buschmalve, Lavatera 'Barnsley Baby'. 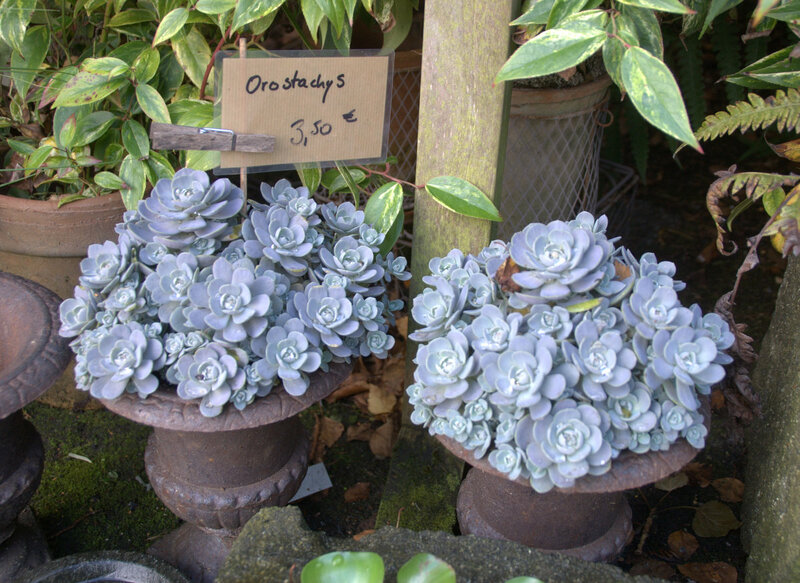 Yes, these succulents were really this blue-gray color! Stunning! 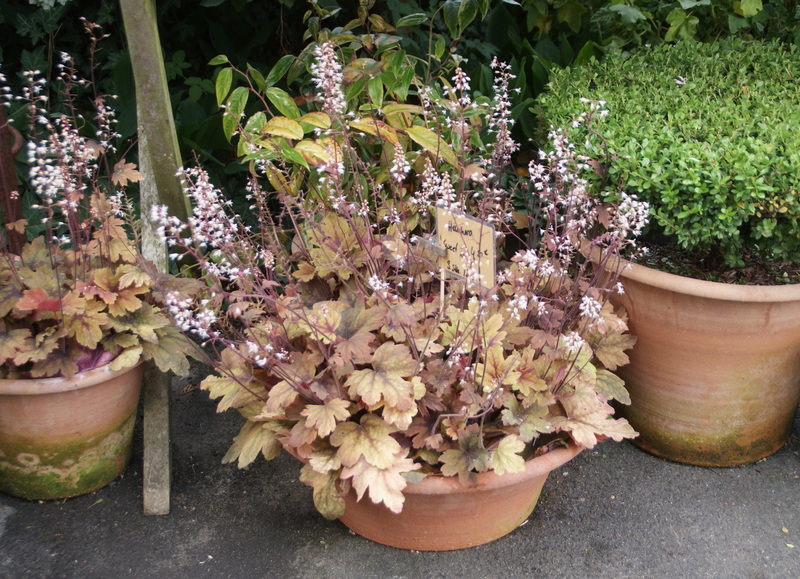 These heucheras represent autumn so perfectly! 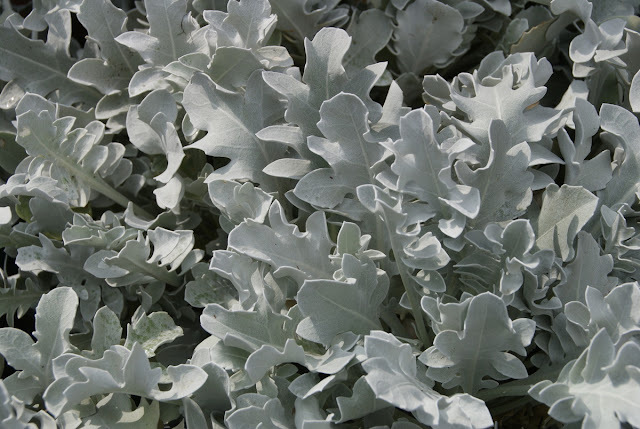 For me it doesn't get much better than these silver white leaves: Eis Flockenblume, Centaurea candidissima 'Silverado', again! Most of the time I am not too keen on warm color schemes, but this display won even me over. 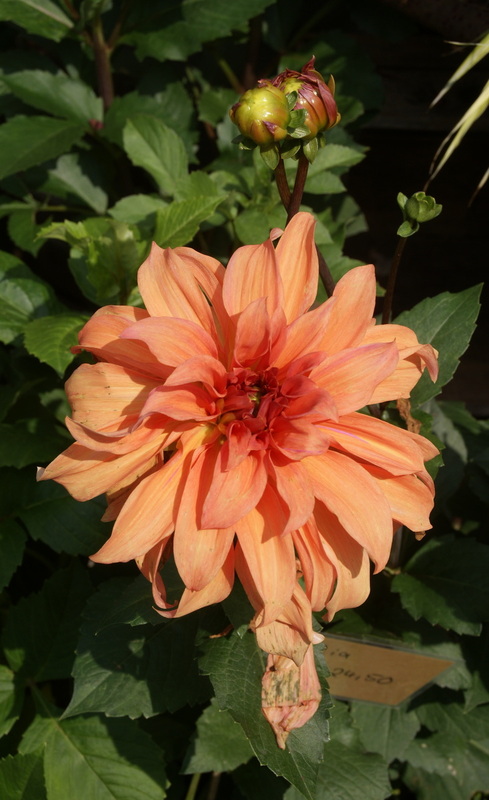 Lovely Dahlia, unfortunately I don't know the name of the variety. I think the purple and red heucheras together with the yellow-chartreuse grasses just look so beautiful with the yellow and red flowering plants in the background. 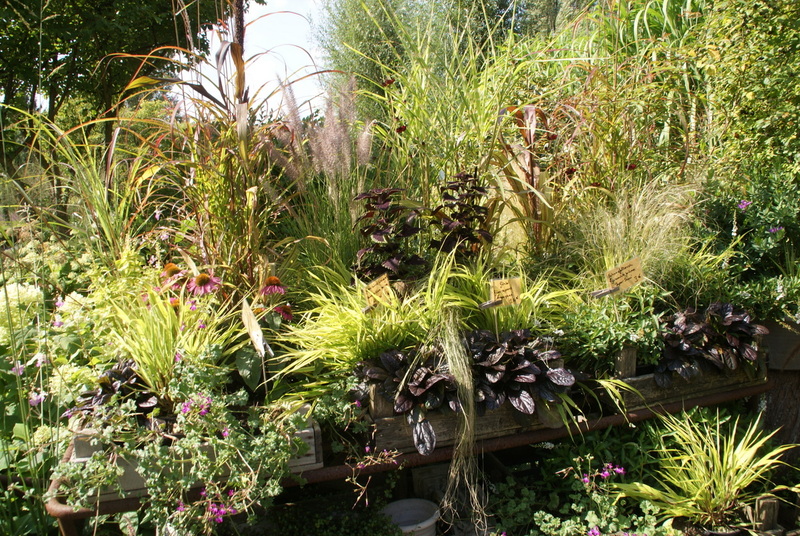 Another display area focusing on grasses and green leaved plants. Grasses are a huge topic in this garden. 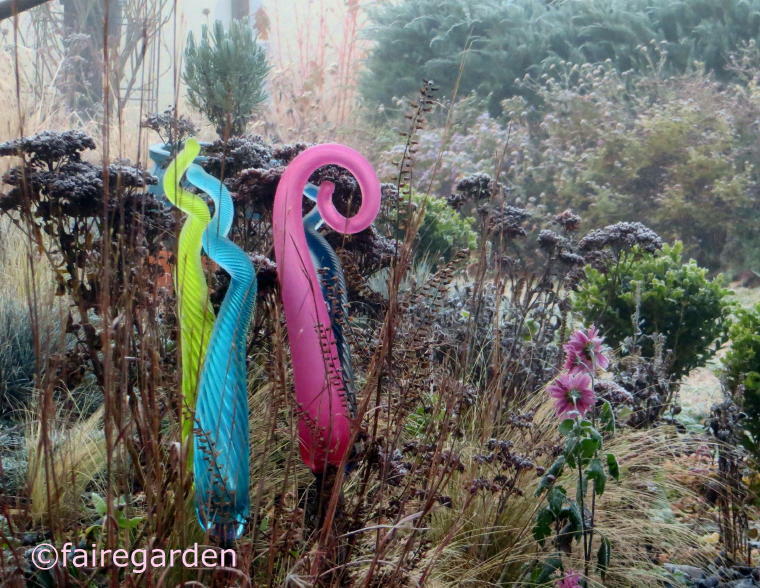 They seem to be very trendy anyway in these days in the garden world! Plants and vessels simply arranged with taste and love. The metal structure that the climbing plants have conquered already is really cool. They had a great selection of small succulents. I can't help but think that they are presented in the German way, neat and orderly! The one missing must have been just bought. I just love their ability to arrange plants at HORTVS. Mouthwatering! Again, dark purple heucheras together with chartreuse-yellow grasses. Just awesome! 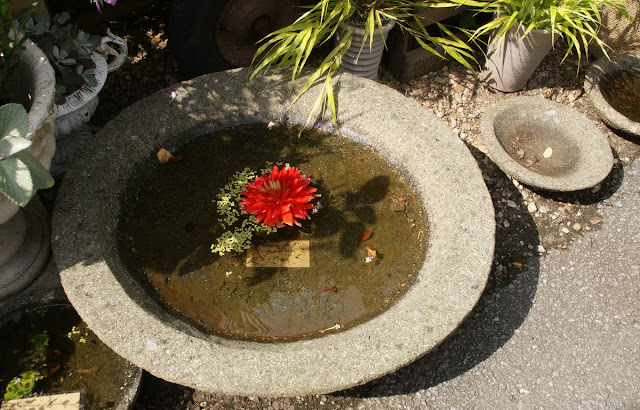 Loved the Dahlia bloom in the flat bowl together with a very delicate water plant. 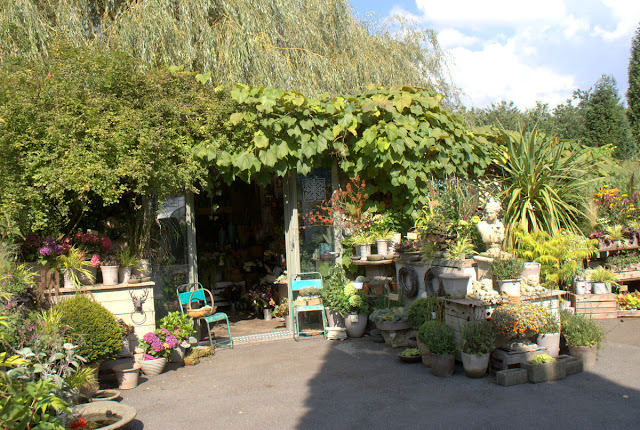 The entry to the garden and florist shop. A new bust that is not kitsch like so many that you see in America. Unfortunately, I forgot to check the price tag. The limbed-up trees to the left look pretty cool, don't you think? I hope you have been as fascinated by their plants for sale display like I was. 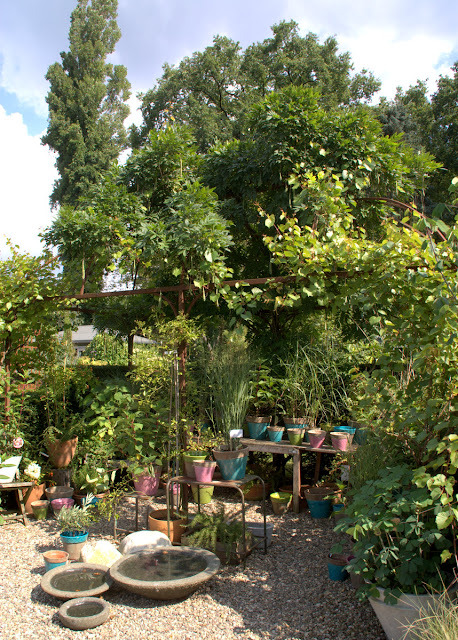 In the near future I will be blogging about the garden itself. Let me tell you already, that you will be in for a real treat. Peter Jankes' garden is incredible beautiful in an understated, subtle and most unusual way. Thanks for visiting my blog and wishing all of you a great start into the new week! Two weekends ago I did another Periscope broadcast about my front yard and today I would like to share it here on the blog with you. 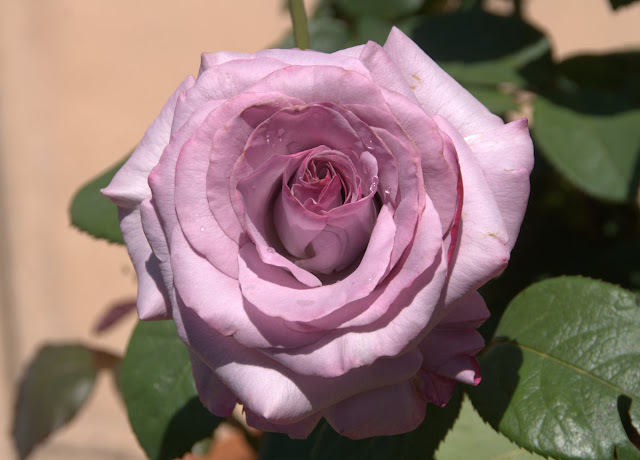 I hope that you enjoy seeing videos of my garden as much as I do taping the Periscope shows. 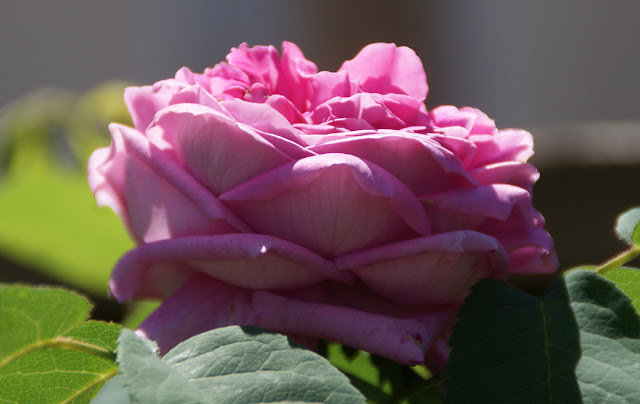 In this one I focus on showing some roses ('Our Lady of Guadalupe', 'The Prince', 'Pretty Jessica') that were blooming in the front yard and also salvia 'Mystic Spires Blue', which is a show stopper in my garden. 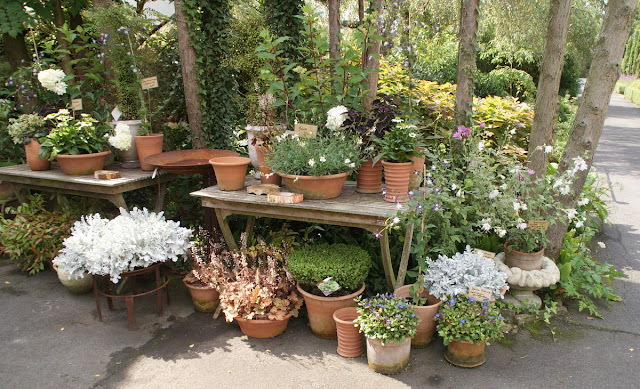 I am also featuring geranium 'Rozanne, dianthus 'Floral Lace White', flowering cyclamen and other plants.